BATHURST, NB – The Atlantic Canada Beer Blog reports that a new initiative to promote the breweries of northern New Brunswick has officially launched. 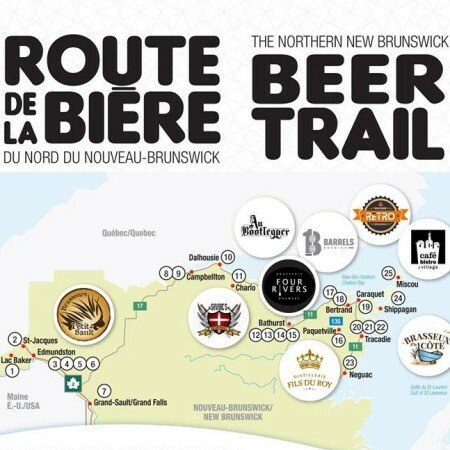 The Northern New Brunswick Beer Trail is a route that runs for 320 km across the top of the province, with stops at nine breweries including Les Brasseurs du Petit-Sault, Savoie’s Brewhouse, AKA Beer at Au Bootlegger, Four Rivers Brewing, 13 Barrels Brewing (opening this autumn), Distillerie Fils du Roy, Brasserie du Village at Village Historique Acadien, Brasserie Retro Brewing, and Brasseux d’la Côte. In addition to the breweries, the route also features 25 restaurants and bars that serve local beers, and four tourist information offices. Printed copies of an informational map of the route can be found at locations throughout the region, and a PDF version can be downloaded courtesy of ACBB.